Wait, if my car is actually an R7U its eligible to race, that sounds awesome. I've massed quite a collection, so I can certainly help out. You'll need to find out if your car was raced or if it was a spare. Check for signs of a role cage being installed ... or if your car still has original paint, then it was never raced. Drop me an PM with your email. Got your emails and PM's. I'm sure I have info you'd find interesting. We can still order some of the decals your car may have had - at least the windsheild one is the best looking on a white car. Talk to you soon. We can still order some of the decals your car may have had - at least the windsheild one is the best looking on a white car. Talk to you soon. I think I sent you an e-mail from vfbody about the exhaust set up on our players cars, havent gotten a reply, maybe it didnt go through? but yeah I'd be very interested in this info too, e-mail is [email protected], hope to hear from you soon . I think this one is fake, it has t-tops. Also in Canada if you were a Owner or Driver for the Players series you could have gotten a 1LE with T-tops, AC the whole bit for driving on the road if you wish. I have seen one with a SPID sheet & all... I am not entirely sure how it worked but I know a few 1LE cars did come with Everything. 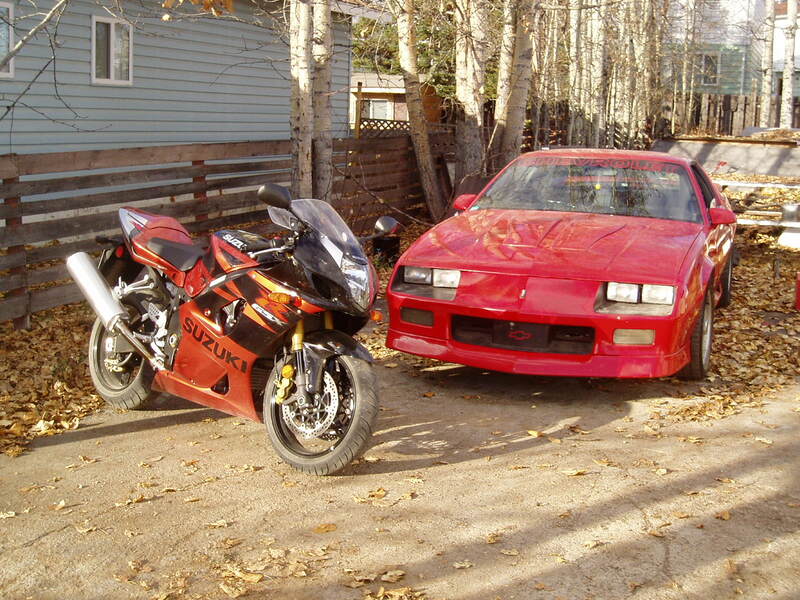 That particular car on Craigs List appears to be someones modification. Or it just has the Aluminum Driveshaft which is not that uncommon since it was also available w/o the 1LE. Not sure about this. Certainly GM Execs could order unusual things, but there wasn't any published information about drivers being able to order stuff. Rather they were encouraged to drive their cars ON THE STREET. So no need to order an AC model. Actually prior to 1990, all cars had to be registered and licensed. I've seen a T-top 1LE car locally here a while back. Rather odd. You'd have to trace it's history to see who ordered it or if it was a GM exec car. Mine is 1988 IROC, A4U car. It does NOT have a 1LE code, no players would have had them until 1989. Hoever mine does ahve the PBR brakes all arond, NO A/C , 305 speed B/W 9 bolt differential etc. there were 4,705 camaros IROC/Z28 midel number 1FP87 22DR- sport coupe imported into Canada that year, and 71 with A4U. Sold by Applewood chev. in Mississauga. and yes it was raced!!! ouch has scars and is still being raced. A4U was a player's only code. There isn't any chance it would have come with A/C, T-Tops, etc. Granted I have not documented each car, but I can almost account for all of the A4U cars in the series. In order for A4U to be processed (same as R7U), you had to be a registered driver with the series. Gm Motorsport had to approve the order. Consider the engines were specially built for the series too ... not that GM wanted to sell these to the public (higher cost to produce). I expect 1LE + A/C + T-tops seems to be something that happened. I am very doubtful that a player's car would be that way ... but who knows, one may have been specially ordered. I could ask the GM engineer who worked on it and see if he remembers anything special being ordered. I should probably retract my statment, I am sure i am right but without any proof I am spinning my wheels like having the axel on jack stands. 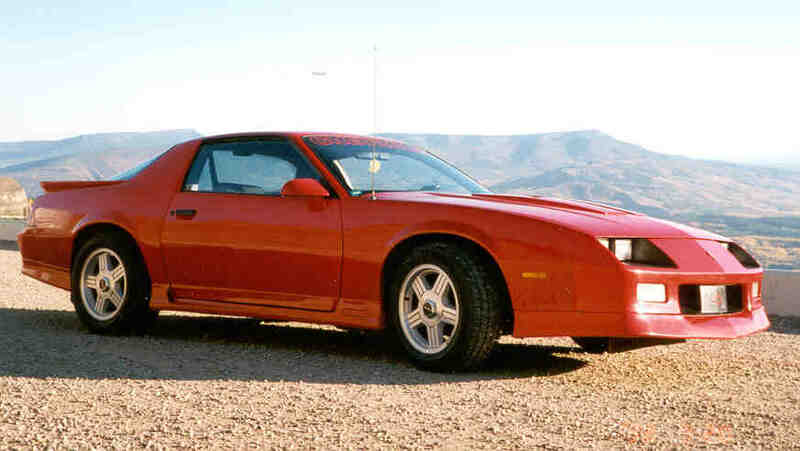 were firebirds and camaros the only cars used? I think we have all been proven wrong or right ... GM did many one-offs. I don't discount the fact that there might be one. Seems finding a 1LE with no options is more uncommon than one with options. The Canadian Player's series used Camaros and Firebirds only. There was also a Corvette challenge series which ran in the US - 89-90 range. Can't recall. Mark, Barry here again, I also noticed when I pulled the interior out of the car there were spots on the floor where the paint was scorched, I think from the exhaust. Is that possible? Hi Barry. I responded to your email. Yes, on most race cars you will see scribe marks are the strut towers for different locations. Usually setup for a specific track. 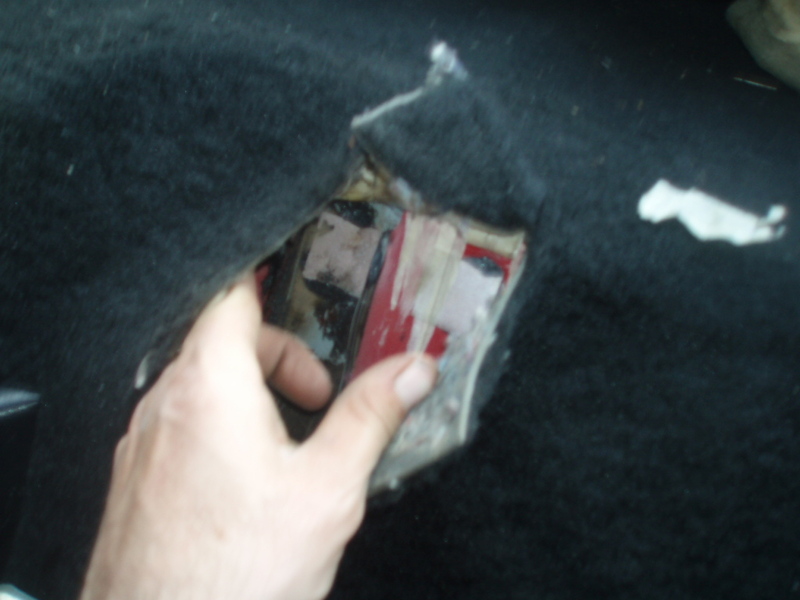 The exhuast was routed pretty close under the car and in places where it was not designed for. So certainly it would have gotten hot. 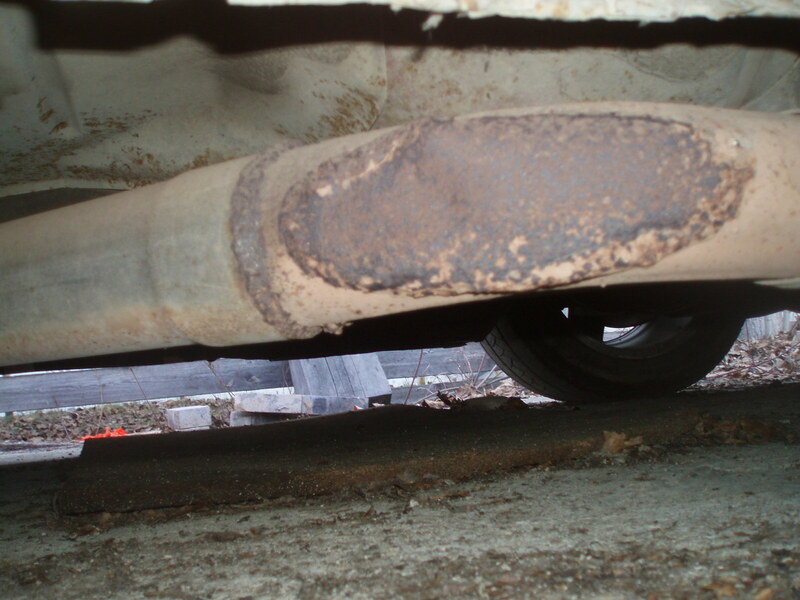 And often the side pipes got hammered up from road abuse, so one might have been sitting abit close. It's a race car ... there will be many "unique" characteristics. :-) But look at it this way ... every dent and every misaligned body part has a story to tell. My name is Todd Nichol, and I raced in the Player's/GM Motorsport Series for 4 or 5 years. Over that time I bought a few new Trans Ams for the series (for some reason I kept wearing them out each season! ), I still have the last car that I raced in the final season of the series. It hasn't turned a wheel since the last East/West shootout event in Quebec, and sits in my race shop still decalled in series livery, complete with cage, fire bottle, seat, rims, etc. My daughter thinks she'll get her hands on it some day!! Although these days I get my racing fix from the Nascar Canadian Tire Series, as well as competing in the WEST Tour, I hope some day to find time to fire up the old Trans Am and maybe compete in a Vintage Event or two. The Players/GM Series was a great series; it afforded many Canadian racers the opportunity to compete in a truly professional environment at some great venues like the Toronto and Vancouver Indy's, Calgary, Halifax, Montreal, Mont Tremblant, and Mosport, just to name a few. I believe Mark has some pictures and info that I've provided him; if anyone happens to get into Edmonton some day feel free to contact myself and I'll be happy to show you the car and shop. Hi Todd. Glad you stopped buy. Great to hear from a driver/owner. Your car is one of a few survivors from the series. Great to hear it's still in "as-raced" condition. I can offer that the car looks great ... have few pics of it. 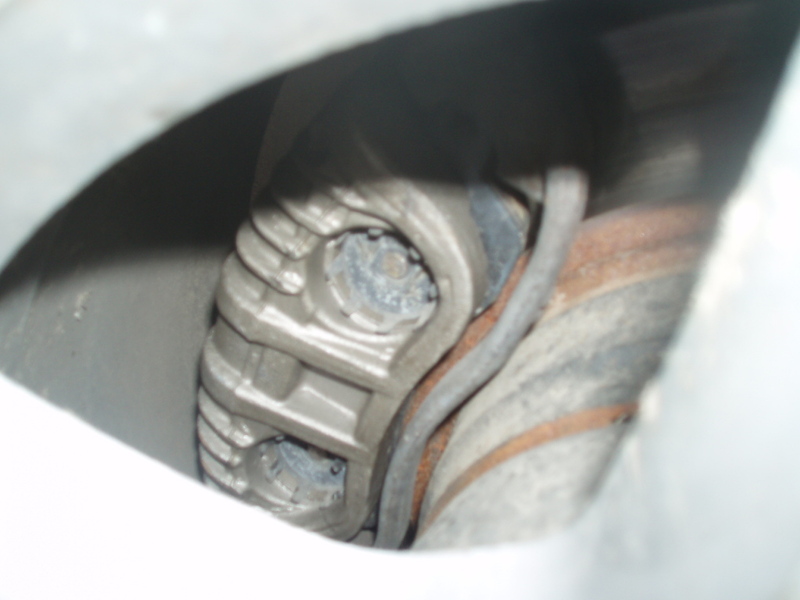 The car still has the ultra rare brake cooling ducts as supplied from GM. It's surprizing to think of Vintage racing, but the Player's cars now qualify for some series. Out east there is a Vintage class which is 20 years. Out West, the Champ car race had a vintage class this year. It will be fantastic to see a few Player's cars take up the class. I hope to have one of my cars ready to race ... just need to find an original Player's series driver to take it out (although I'd love to drive it). PS. Cameron Hope also dropped in to say Hello a while back. PS#2. I can post a pict of your car here if your OK with it. I am very happy to be able to provide some pictures of some ultra rare GM race only f-body parts. 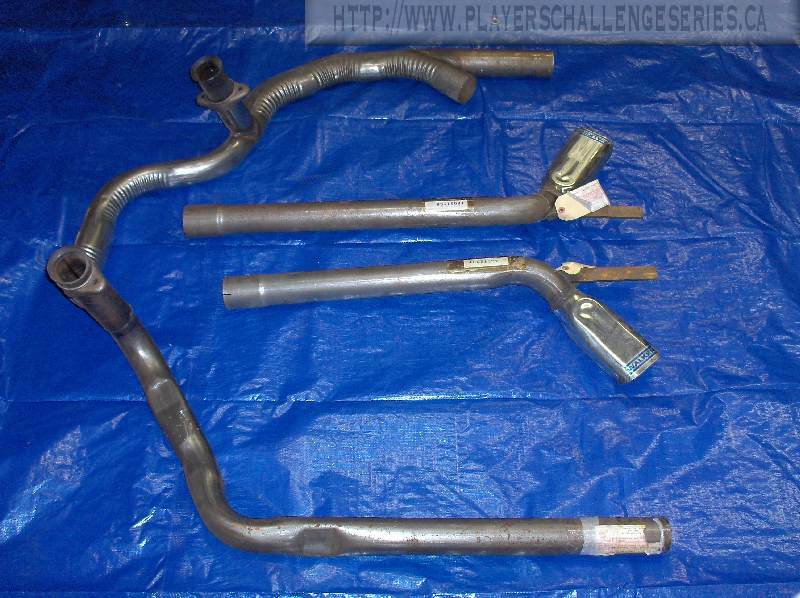 Below are pictures of a racing exhaust system built for the 87-92 Player's Challenge series races in Canada. 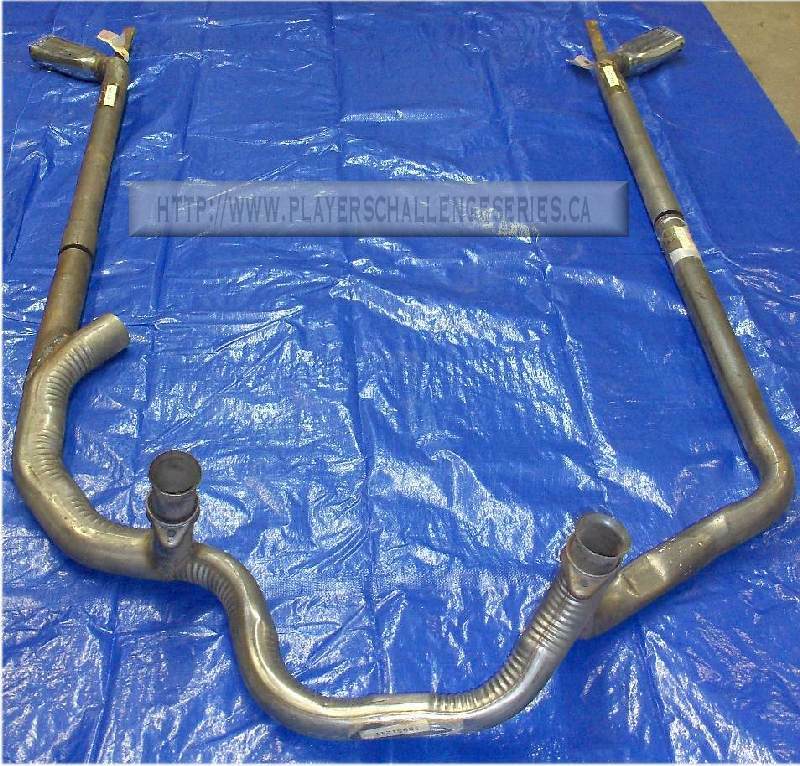 This exhaust system was available over the parts counter to racing teams and was required to be installed on the race cars. The system is "bolt on" in the sense it replaces the main crossover (notice the lack of the dual cat N10 setup). The side pipes install in place under the door sill area and exit just infront of the rear wheels. The chrome extensions are 1970 Chevelle SS parts that have tabs welded on the inside with threaded holes to allow for an aluminum cap to be put on. 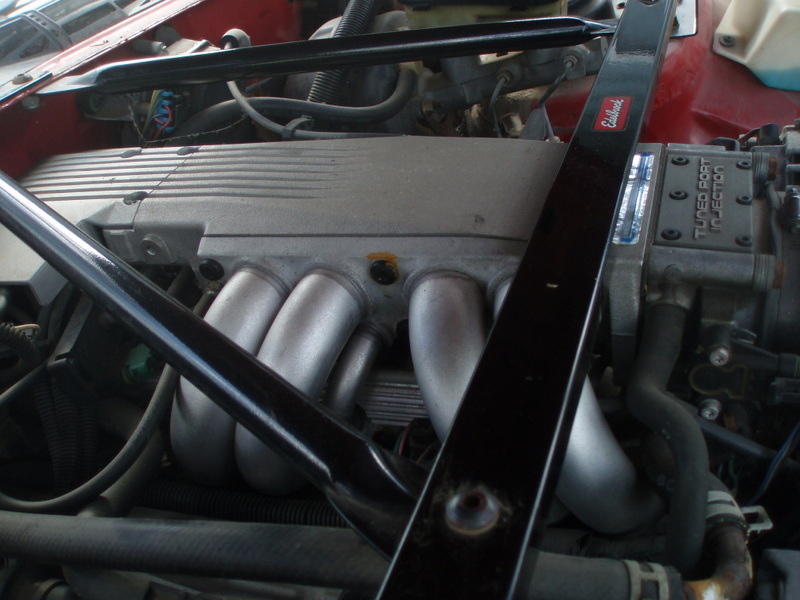 The design allowed for driving the car to the track with closed exhaust, and then upcap the exhaust for the race. While the HP gain was minimal, the exhaust was really for the fans. 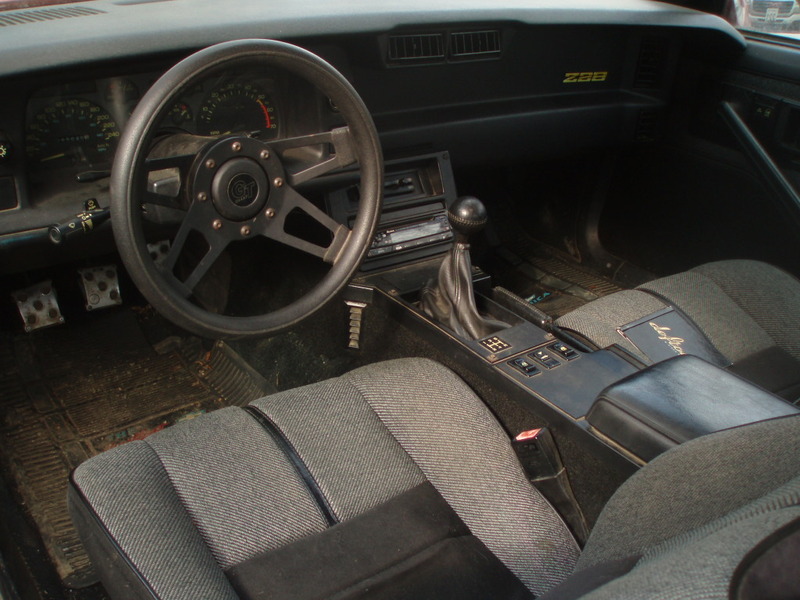 In 1986, they had only a passenger side exit. By 87, then added the driver's side for true exhaust so they could assault the fans on both sides of the track. This exhaust system is BRAND NEW, NEVER INSTALLED. Still has the tags and part numbers intact. It was an unbelievable find and a part of history. I'll be blueprinting the setup and taking better pictures as time permits. I could not wait to post up some picts. Early Christmas! Here are the pipes unassembled. 3 parts made up the package. Here they are loosely assembled. Here is a close up of the side pipe. There are some strange bends to get out and under the door. I've added a bunch of magazine articles to the Player's web site. They provide a good summary and history. It still is aparent that the car once had a rollcage in it and it shows that it as been repainted. I really like the car, it's very surprising how well it perform for a car this old! I am the proud third owner. Last edited by 86hardtopT/A; 11-19-2007 at 03:19 AM. you have a 1 of 26 car there... cool car, do you still have the SPID (in the glovebox with the RPO's) sheet??? MArk, that is the exact setup that is on Ron Fellows car at the Cdn motorsports hall of fame. 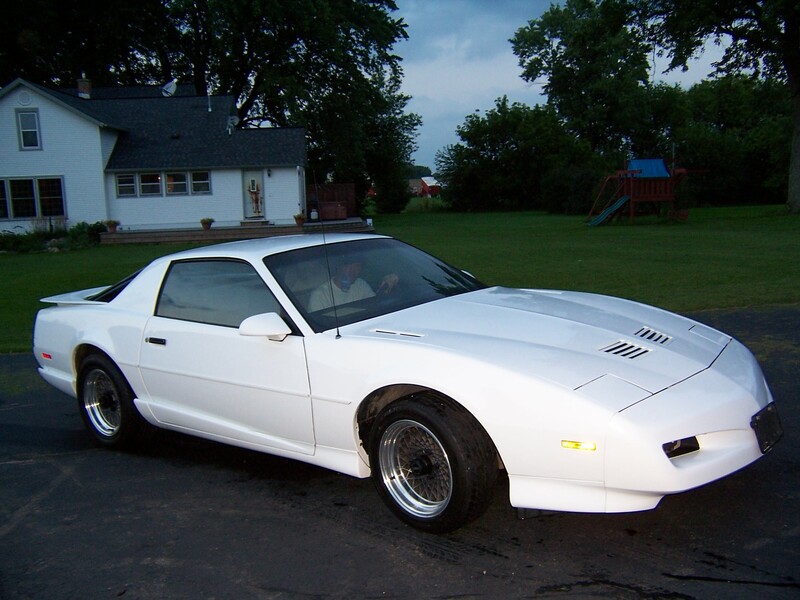 Very cool ... 1986 L69 Trans Am ... very rare stuff. Good to hear it will be making it's way into vintage. If that fellow needs decals, drop me a note. One of the original two manufacturers still makes them! May as well look the part while racing vintage. I dont know about the documentation and cant look for it now as the car is in storage for the winter. 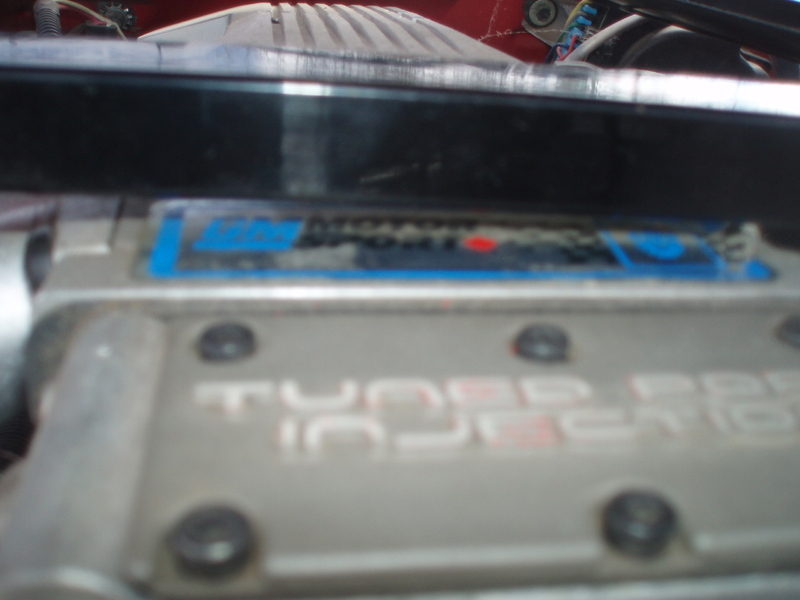 I've not been able to document a 1986 car in detail, however I understand the "Race" engines had a decal on the valve covers with "St Catherine's" on it (where the engine was built). In 1986, the Player's logo would have been the checkered flag version, not the one at the start of the thread. send me a few pics and I can help verify the date of the decal. 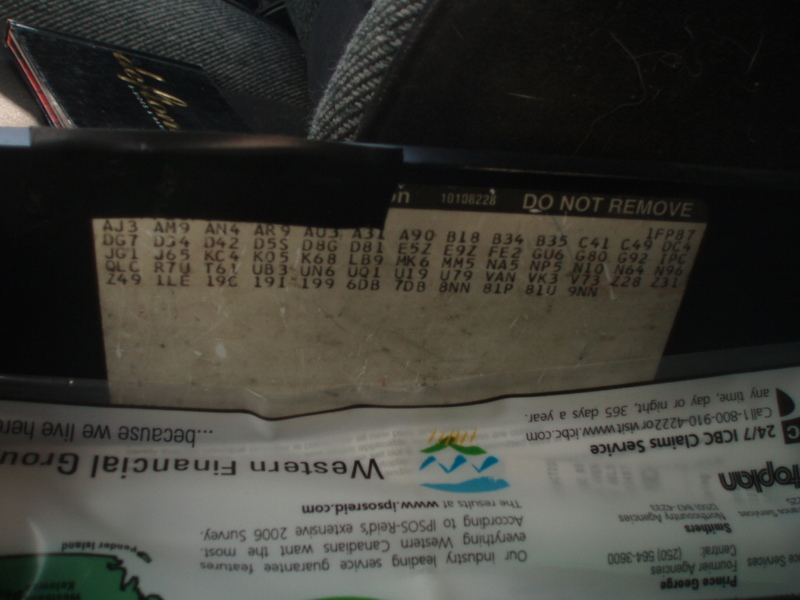 Check the RPO codes inside the storage locker drivers side at the rear. If the car is a 1986, then the Player's code is A4Q. Check your RPO's. If they are missing, go to your local dealer parts counter with your VIN and have them check it. 1986 was not the year for PBR brakes, but it could be an ex-race car that was upgrade in later years. The 1986 cars I have documented have VIN's in the range of 168XXX. Also it has the LG4 which I would think strange to have the rest of the equipement on his list from the factory. Interesting thread guys. I went a couple of laps in a players car wayyyy back when. You know I have some pics of Shannonville I think summer '88 with about 50 or so f-bodies racing. They were setup like players cars but obviously could not all be R7U cars -- they did not make that many of them. is anyone interested in copies? Most likely these were the 88 versions, RPO A4U. Chances are you have pics of my 1988 TA at Shannonville! I'll host pics for you on my page if you can scan them. I'll go outside and take some pics of the RPO sheet and the motor. Do you know where I could get a new 3:42 rear end for it? The seal blew out a few years ago about 40km outside of Ft Nelson I had to drive it home at 20 km/h because there was no towtrucks available and if i let it sit on the hwy,the locals would have torched it. (Almost all cars that break down on the alaska hwy get torched within a day.) anyways I've been calling all over north America trying to get the 28spline 30&5/16th inch long halfshafts and am having 0 luck. I'm able to get all the bearings and seals for it but not those 1/2shafts. The gears themselves look alright but maybe if you know of a whole diff/axle I could get. BTW mine has the N10 code but it's 2 into 1 into 2 and I can see where that juicy side exhaust (pictured in this thread was attached.) stay tuned for more pics. Here is a pic of where the side exhaust was tied in sorry my other pics were over 1.0mb, I'll try again tmrw. Would you be able to tell me how to find out who drove it in the races back in the day? Thank you. wicked car! do u know any details of the race history? check out fbodycanada.com we r starting to collect/share lotrs of R7U info! Thanks IROCNParts. Ive always loved Gen3 Z28s. My dad got a brand new white 86' Iroc back when I was 15 and I knew I had to get my own one day. I bought this one in Sylvan Lake Alberta in Sept of 94'. I've finally ordered the proper Aerowing (RPOD81) for it as the old Trans Am wing is starting to decompose. It's got Rear end problems as I described and I'm waiting for a distributor to get me a Superior EV104 axle set for it. It runs great and the Interior is all black & mint. Incidently I put new PBR calipers on the front and they only cost $105each rebuilt somewhere out of Vancouver. Sorry I don't know the race history for it but am hoping someone on here could help me figure it out. I will definately check out your website!! Here is some more pics I just took. hey cool! I remember ordering my info a couple years ago! add some pics when you get it! Congrats on a great car!